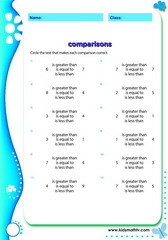 Comparison math worksheets for children from 1st to 6th grades. 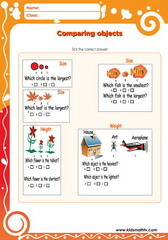 These worksheets cover a number of primary school math subtopics on comparison e.g. comparison of number of objects using notions of more, less, greater than, less than or equal to. Also learn to use signs like >, < or = in expressions. 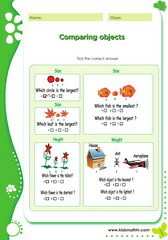 At kindergarten, kids start learning how to compare with objects e.g. more or less apples but at higher level, they start learning to compare across different place values. 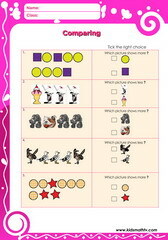 These math worksheets are in PDF format and hence can be printed any time as many as possible; teachers and parents of primary school kids can therefore supplement their math course. 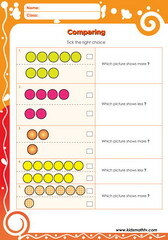 Practice Compare mixed groups with pics with this worksheet. 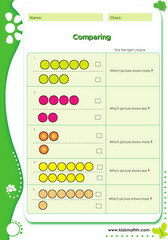 Practice Compare more few with dots with this worksheet. 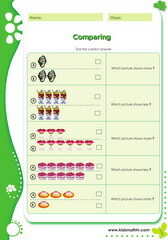 Practice Compare more few with pics with this worksheet. 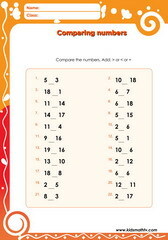 Practice Compare numbers 1 to 20 with this worksheet. Practice Comparisons big smaller with this worksheet. 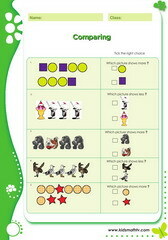 Practice Comparisons long short with this worksheet. Practice Comparisons shuffled with this worksheet. 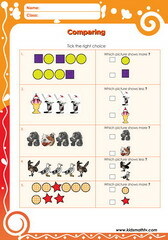 Practice Compare more few with pictures with this worksheet. 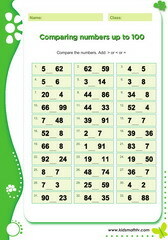 Practice Comparing numbers up to 100 with this worksheet. 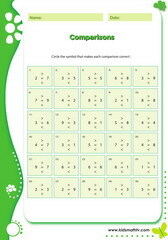 Practice Comparisons numbers 1 to 10 with this worksheet. 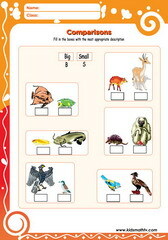 Practice Comparisons numbers 20 to 98 with this worksheet. 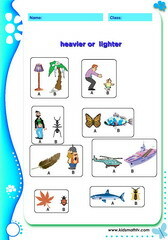 Practice Comparisons shuffled objects with this worksheet. Practice Comparisons of numbers 1 with this worksheet. Practice Comparisons of numbers 2 with this worksheet. 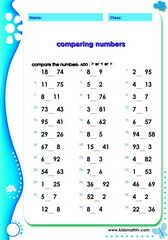 Practice Comparisons of numbers 3 with this worksheet. 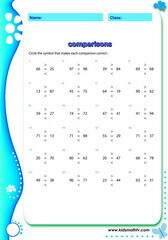 Practice Comparisons of numbers 4 with this worksheet. 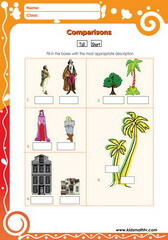 Practice Comparisons of numbers 5 with this worksheet.